A few months ago, I took the opportunity to volunteer some time on a Saturday morning at Ssubi is Hope. It started out as just another opportunity to take some time out of my schedule to help others and along the way, I learned that Ssubi was not only helping those in need across the world, but they were doing a lot of work to help the underserved here in San Diego. Laura Luxemburg, the Founder, was speaking to our group about the many projects Ssubi is involved in and she mentioned her work with the athletic trainers employed by the San Diego Unified School District. Athletic trainers can come to the SSubi warehouse and “go shopping” for needed supplies that cannot typically be purchased because of the limited budget resources available. This piqued my interest and I wanted to learn more. Laura was gracious enough to take the time to answer a few questions about Ssubi is hope and the local athletic trainer supply program. Please find our conversation below. A4IA: Can you briefly talk about how Ssubi got started and why you do what you do? Laura Luxemburg (LL): Ssubi was started on the premise that where you are born or where you live should not decide whether you live or die. 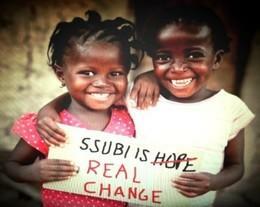 Ssubi is Hope supports projects that are less likely to be funded by large organizations. Filling those gaps that are left behind. Internationally, that started with helping at the Asili Health Center in Uganda. A 60-bed facility that serves three districts of 49 villages, a population of over 660,000 people. We purchased their first medical supplies and built businesses for sustainability such as a piggery, chicken farm. grocery store, and clothing store. All these benefit the health center so they can hire staff and always have medicines. Our local project “Greening for Good’ was started out of the continued need for medical equipment and supplies at the Asili Health Center. March 7, 2014, was our “kick off” with our first pickup from the VA San Diego. From there we have gained many hospital “Champions” and the collections have been much more than we could ever need. This has allowed the program to expand to other small underserved health centers and clinics around the world and to the underserved in San Diego. The model is straightforward, we are protecting the environment by keeping perfectly good medical supplies out of the landfill; improving access to health care across the globe by providing critical supplies and equipment locally and globally, and supporting community building by providing volunteer experiences and at the same time bringing awareness to the need for recycling. A4IA: I know you provide needed medical supplies to hospitals and clinics across Uganda, but you mentioned you do participate in community giving here in San Diego – what types of projects have you participated here in San Diego? LL: Our Homecare base continues to grow with the help of our Hospital “Champions’ and Internet exposure allowing us to connect with the underserved. We provide equipment and supplies to those patients that have no other avenue for needed medical supplies and equipment because they are not covered by insurance, live on a fixed income, and/or cannot afford the added expense. We are also working with Rotary San Diego Chapters, Physical Therapy for All, Jonni’s Kids and many others providing their patients and connection with the equipment they cannot afford or when they are turned down by other organizations within the community. We are also supporting patients suffering from ALS by providing acute care hospital beds when the patient has reached advanced stages of ALS. Many times, family and friends contact us about someone who needs assistance and we have given away hospitals beds, wheelchairs, electric wheelchairs, walkers, supplemental nutrition, bandages and more. A4IA: How/who did you get connected with in the SD Unified School District to be able to provide supplies to ATs who otherwise wouldn’t be able to afford “fancier supplies/tape”? LL: Our supply and equipment collections are great and I find myself having to think outside the box to find a “home” for them. The goal of “Greening for Good” is to help both locally and globally. So, repurposing back into our local community is always on my mind. Going through the boxes and bags of donations there was an abundance of gauze, tape, and various first aid supplies. I thought who could use this and was not already recieving help from another organization and our public schools came to mind. I made a call to Scott Giusti, Director of the Athletic Departments for San Diego Unified and shared our program. The question was asked, “Was there a need for the supplies and would it be of help?” He quickly said, “YES!” Scott told me that the City had just implemented a program to have athletic trainers on staff at each high school and put me in touch with the contact person. Lead athletic trainers from UCSD came to the warehouse and I explained the program and what I would like to do, if there was a need. They shared the list of items that each school was to have on hand. The list easily added up to over $10,000 of supplies and equipment. Unfortunately, a budget of only $2,000 is allocated to each school for such supplies. Some of the schools did not have training tables so that was one of the first items we put in place. The plan was to make sure each of the schools had the basic equipment and supplies and the program could grow from there. A4IA: What are some of the most popular supplies that AT’s “shop” for and how does the program work? LL: The athletic trainers most often pick up alcohol swabs, gauze in various sizes, tape in various sizes and kinds. gloves, scissors, ace wraps, cold packs, Band-Aids, crutches, splints, wheelchairs, and canes. The program is very simple. The athletic trainers make an appointment and come to the warehouse. We have a cart with the basic items stocked. They are given a bag and they take what they need. They can come back as often as needed throughout the school year. A4IA: What if other HS athletic trainers or school districts wanted to connect with you to participate in this opportunity, what’s the best way to reach you? LL: Athletic trainers or schools can contact us through our email: ssubihut@gmail.com, our website: http://www.ssubi.org or by calling 858-568-3512. There are also volunteer opportunities for high school students (and anyone else in the community who is interested). We encourage our schools to bring students and introduce them to the program. Our goal is to bring awareness to the issues and educate people on how they can help. I would like to thank Laura for her time and her continued work with Ssubi. I look forward to my next opportunity to volunteer to help those in need by packing and organizing supplies. I hope you’ll consider volunteering too. If you’re an athletic trainer in need of supplies and equipment, contact Ssubi to learn more about the program.